Old Santa Cruz Hwy’s ancient concrete can be ridden for two miles between Summit Road and Hwy 17. 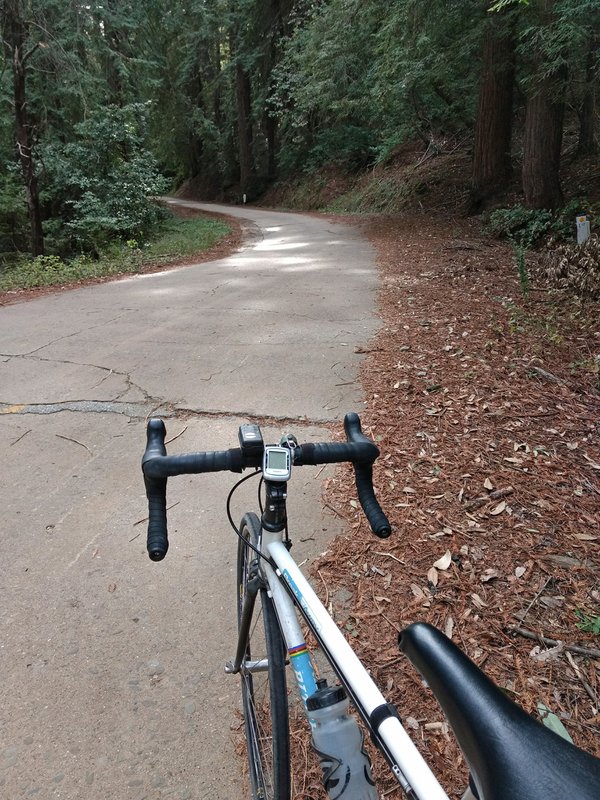 Today I checked out Old Santa Cruz Hwy between Summit Road and Hwy 17 for old time’s sake. While Old Santa Cruz Hwy is still all concrete, it has been covered with a thick layer of pavement, except south of Summit Road. The original road from San Jose to Santa Cruz dates back to 1856. It followed present day San Jose-Soquel Road from the summit. Mountain Charley’s toll road was used later on as well. Richard Beal has all the details in his book Highway 17. The road was improved along the current Old Santa Cruz Hwy and Glenwood Drive/Highway alignment to state standards in stages starting in 1915. Concrete was laid in 1921-22, so the pavement is nearly a century old. The concrete is cracked in many places, but it’s still in daily use, with paved patches here and there. The road’s longevity bear’s witness to the durability of concrete. Nothing compares. Asphalt lasts a long time, but concrete is the clear winner. I can’t say the same for the land around the road. Several slides threaten the road, and trees have fallen in numerous places. Winter rains do that to the Santa Cruz Mountains. This entry was posted on January 26, 2019 at 2:49 pm and is filed under Ride reports. You can follow any responses to this entry through the RSS 2.0 feed. You can leave a response, or trackback from your own site.